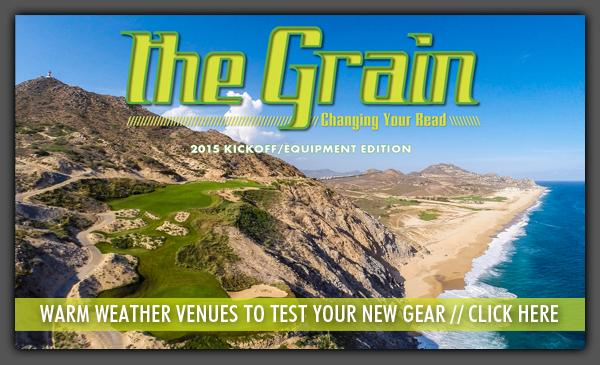 At least in warmer climes, the 2015 golf season is well underway, and our opening issue of The Grain offers everything players need to usher it in. Many of the writers of The A Position are fresh from this year’s PGA Merchandise Show, and they’ve returned with reports on the latest gear, from clubs–drivers to wedges and putters, balls, GPS systems and shafts. John Torsiello takes a closeup look at shoes, while Tom Harack casts his eye on the latest in golf apparel. It’s been a tough winter in the northeast, which makes Jeff Thoreson’s piece on warm weather climate courses all too apt and appealing. And if his six choices don’t make your mouth water, our “Front Nine” section will appeal to animal lovers–nine tracks named after creatures great and small, “Animal Magnetism”. We have an instruction video with former LPGA player Meredith Kirk which is easy on the eyes, as Ms. Kirk was named one of “The Most Beautiful Women in Golf 2015.” And elsewhere in the issue are details on how to win a golf vacation to Myrtle Beach with Meredith. There are other contests to enter, too. Readers can win trips of a lifetime to the Kiawah Island Golf Resort in South Carolina, or the Rosen Shingle Creek Resort in Orlando. So stop putting on the living room rug and get to work flipping the cyber pages of The Grain to get your golfing year off to a lively start.